Little Miss Muffet (2 years, 9 months) was screen-free for nearly the first two years of her life, and until a couple of weeks ago, she had never seen a full 30-minute television show. I realized, though, after showing her a few clips from Mister Roger’s Neighborhood on YouTube, that his show was perfectly suited to her developmental level and her interests. So, lately, she has been watching an episode of Mister Rogers after lunch, before lying down for a rest. She is enjoying getting to know Mr. Rogers, and Mr. McFeeley, and all the residents of the Neighborhood of Make-Believe, and I’m getting a great big dose of nostalgia as I remember the years when Mr. Rogers was my television neighbor. But in addition to the delightful walk down memory lane, I’m also realizing for the first time what makes this show so great. They’re subtle, but there are two main things Fred Rogers did on his show that continue to make him a great role model for parents even 13 years after his death. The first is that when Mr. Rogers teaches a new concept, he tells a story about himself. Instead of saying to the child, “You should do this” or “This is how you do this,” he says, “When I was a little boy, I used to…” or “Sometimes I like to…” For example, there was an episode where he was cutting paper strips and taping them together into a paper chain. He cut the first strip with scissors, and then said, “Before I knew how to use scissors, I used to tear the paper.” And then he demonstrated how a child not yet ready for scissors could make a paper chain without them. In another instance, in the episode when he sings “You Can Never Go Down the Drain,” he relates the story of his own fear of being sucked down the drain as a child. 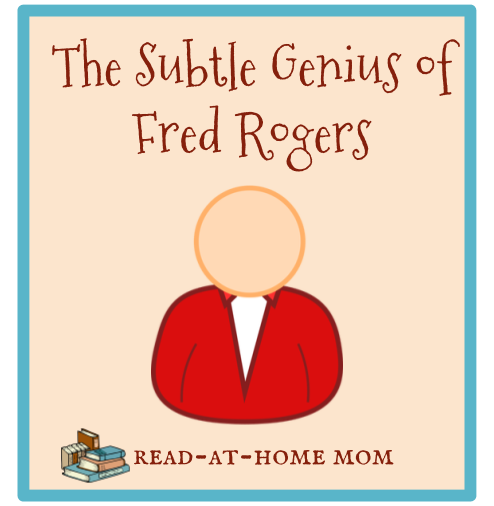 By sharing information with kids through stories about himself, he validates children’s capabilities and beliefs, showing them that learning is a process, and that there was a time when even Mr. Rogers didn’t know all that he knows now. He doesn’t single out the children who haven’t mastered cutting or who fear the bathtub drain, but he still helps them feel secure in their abilities and concerns by including them in the conversation and anticipating what they might need. This is such a subtle thing, but it means the difference between sounding like a condescending know-it-all grown-up and sounding like a caring and authentic neighbor. The second subtle thing I noticed is that when Mr. McFeeley brings videos for Mr. Rogers to show to his television neighbors via “Picture Picture,” the videos don’t just play. Instead, Mr. McFeeley and Mr. Rogers provide voice-overs to accompany the images on the screen. Mr. McFeeley tells what is happening, and Mr. Rogers asks questions - often the exact same questions the child viewer would like to ask if she could. The episodes in which I observed this behavior were from the 1990s, but the idea matches up very nicely with more recent guidelines from the American Academy of Pediatrics about the importance of co-viewing with young children. It’s how I watched YouTube videos with Miss Muffet when she first started to have screen time, and it’s the approach I plan to take with Bo Peep when she gets closer to two as well. The magic of Mr. Rogers has always been his ability to connect with people through the television screen, making them truly feel as though he knew them and loved them. As a child, I certainly felt that he was my friend; it is an unexpected blessing to feel, as an adult, that there are still some things left for him to teach me.